Happy National Cheesecake Day! 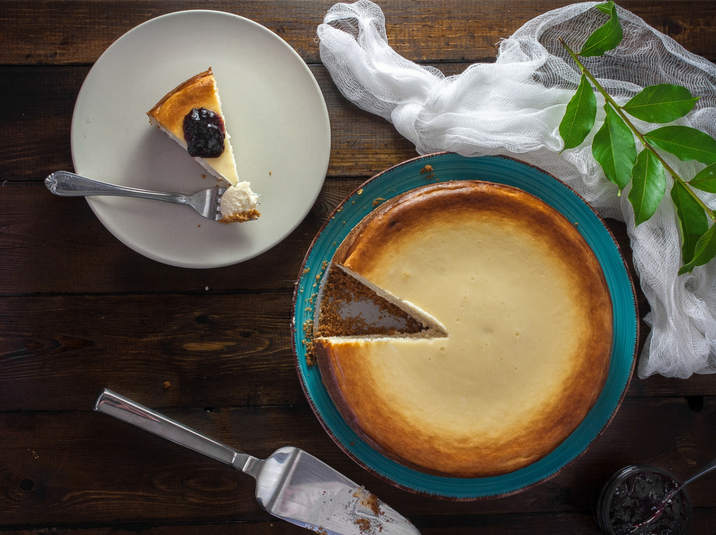 Food holidays aren't always the best for diets, but luckily our friends at Eggland's Best created a low-calorie version of the classic cheesecake, so we can feel better about enjoying this delicious dessert! Coat a spring form cheesecake pan with non-stick cooking spray. Whip together the fat-free cream cheese and non-fat plain yogurt until smooth. Slowly add the eggs, vanilla and artificial sweetener. The mixture should have a light yet smooth texture. Pour into prepared spring form pan. Place pan on a cookie sheet. Bake for 5 minutes then reduce the oven temperature to 230ºF and bake for another 45 minutes. Let cool in the oven with the door ajar, then refrigerate for 4 hours. Top with blueberry jam or any jam from your favorite fruit for extra flavor and picture-worthy presentation!